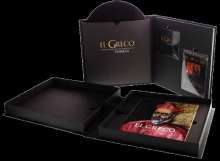 DVD (Region 9) / CD/ 180g Vinyl / 96Page Hardcover Taschen Book. The Box decorated with Plexi Glass, numbered with an Engraving on the Plexi Glass. Internally, there is a support rack for a hardcover book. The print is gold hot foil stamping on black spider. • The DVD of the award winning international edition of the movie ›El Greco‹ (2007, w/ English subtitles) , Directed by Giannis Smaragis. The film tells the story of Domenicos Theotokopoulos, better known as El Greco, a great Greek artist of the 16th century with an uncompromising character, who sets off from his homeland Crete and goes to Venice and finally Toledo, in search of freedom and love. • The Amazing soundtrack of the movie by the legendary Greek composer Vangelis on CD and 180g Vinyl. • The 96-page Deluxe Hardcover book on El Greco (in English) from the Basic Art series of Taschen, written by Michael Scholz-Hansel. Für Vangelis Fans ein Muß! Super wertige fette Box. Vangelis Filmmusik vom Feinsten inkl. dem Film auf DVD in Originalsprache.